NORWICH, England, UK, March 10, 2014 (ENS) – Four new gases have been detected in the atmosphere – all resulting from human activities and all contributing to destruction of the ozone layer. Research by scientists at the University of East Anglia shows that more than 74,000 metric tonnes of three new chlorofluorocarbons, CFCs, and one new hydrochlorofluorocarbon, HCFC, have been released into the atmosphere. CFCs were outlawed worldwide under the 1987 Montreal Protocol in response to growing damage to the ozone layer, the Earth’s natural protective shield against the Sun’s harmful ultra-violet rays. Most have been declining steadily since then, but CFC-113a, one of the four newly-found gases, appears to have been accumulating unabated since 1960. Between 2010 and 2012, emissions of CFC-113a jumped by 45 percent. 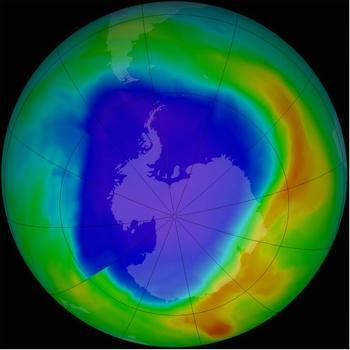 “The identification of these four new gases is very worrying as they will contribute to the destruction of the ozone layer,” he said. “We don’t know where the new gases are being emitted from and this should be investigated. Possible sources include feedstock chemicals for insecticide production and solvents for cleaning electronic components. Dr. Laube and his team found the new gases by comparing today’s air samples with air bubbles trapped in deeply buried snow on the Greenland ice sheet, known as polar firn snow. This type of snow provides a century-old natural archive of the atmosphere. They also analyzed air collected between 1978 and 2012 at Cape Grim in unpolluted Tasmania, an island that is the southernmost Australian state. Measurements show that all four new gases have been released into the atmosphere recently, and that two are significantly accumulating. Emission increases of this scale have not been seen for any other CFCs since controls were introduced during the 1990s, the researchers said, but they are nowhere near peak CFC emissions of the 1980s, which reached around a million tonnes a year. “What’s more, the three CFCs are being destroyed very slowly in the atmosphere, so even if emissions were to stop immediately, they will still be around for many decades to come,” he warned. This research was funded by the UK’s Natural Environment Research Council and the National Centre for Atmospheric Science, the European Union, and the Commonwealth Scientific and Industrial Research Organisation, based in Australia.